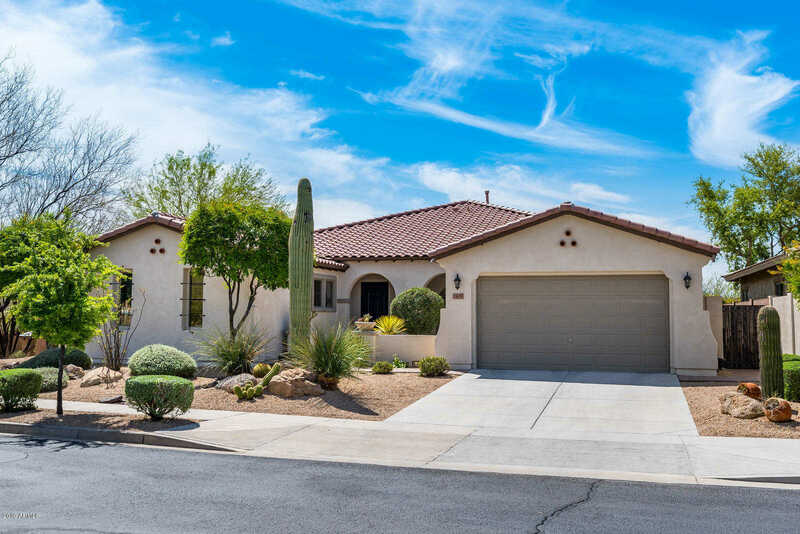 Stunning 4 bed home with 4-car tandem garage, separate office/den, saltwater pool and very private backyard in the sought after N. Phoenix gated community of Sonoran Foothills. Highly upgraded home, spacious great room floor plan, real wood floors, 20” tile, real wood cabinets, newer TRANE AC units, SS appliances, gas cooktop, extended kitchen w/cabinets, wine rack & mini fridge. Kick back & entertain in the low maintenance backyard, built-in BBQ, gas fire pit & large covered patio. Split floor plan, big master bedroom w/over-sized walk-in shower and huge closet! Close to K-8 school and Fry’s Marketplace. Community has year round activities, plus a pool, parks, basketball, volleyball, tennis. Near hiking & biking trails. Easy access WEST to I-17, Dove Valley Rd goes east to Cave Creek Rd. Directions: From Paloma Pkwy, east on Desert Wild Flower, 1st gate on the left, 18th Ave, once through gate go left at round-about, then 2 right turns to Bramble Berry Rd, house on the left. Approximate size: 9711.00 sq. ft. Please, send me more information on this property: MLS# 5905837 – $569,900 – 1805 W Bramble Berry Lane, Phoenix, AZ 85085. I would like to schedule a private showing for this property: MLS# 5905837 – $569,900 – 1805 W Bramble Berry Lane, Phoenix, AZ 85085.